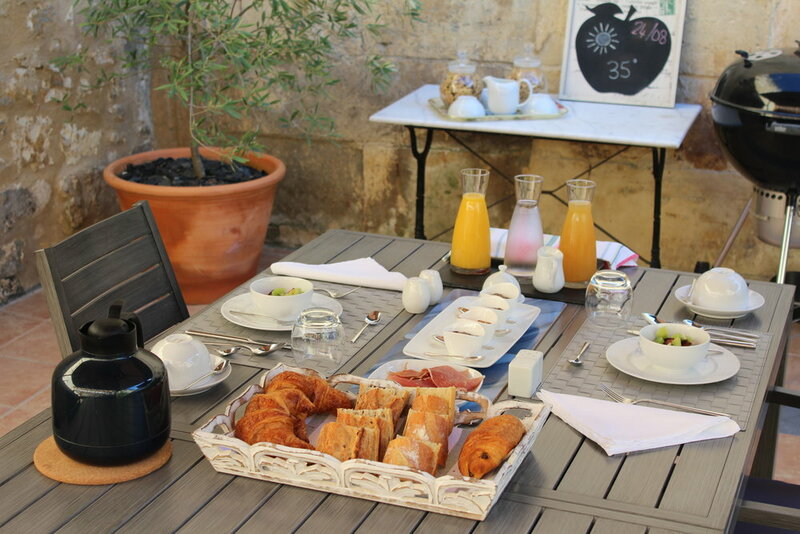 A continental breakfast including; fresh bread and pastries from our local boulangerie, jam, fresh fruit, homemade yoghurt, fruit juice, coffee and tea, is served in either the dining room or the garden. It is our pleasure to offer our Chambres D'Hôtes guests the opportunity to join us at our dining table for a home cooked evening meal. We are both keen cooks and have undertaken cooking lessons at the Nick Nairn Cookery School in Aberdeen. We will serve a two course set meal comprising a starter and main course. Wine will be served with the meal followed by coffee. The menu will change on a daily basis and will be a combination of traditional French, Italian and British dishes. All dishes will include seasonal ingredients, sourced from local markets and shops. A high chair is available on request. Please let us know in advance if you have any food allergy, special dietary requirement etc. and we will do our best to accommodate you.